The Honda Civic Type-R seems a long time coming - in fact, we've already driven a pre-production version. But it wasn't until the Geneva reveal of the Concept that we were able to gauge how it's going to look when it goes on sale in 2015. It's certainly an extreme-looking car, with more than its fair share of aerodynamic addenda. With big flared wheelarches, a stacked rear wing, a rear diffuser with dual twin exhausts and a big rear spoiler incorporating the tail lights it's clear this is no understated hot hatch. But the big story is the expected performance, which is said to be sensational in Honda's first turbocharged petrol road car. To prove it, Honda will be going all guns blazing for the front-wheel drive lap record at Nurburgring - but SEAT has already moved the goalposts with the Cupra R, setting a time of less than eight minutes. Unlike previous versions it will feature a turbocharged engine with more than 280PS and 400Nm of torque putting it among the most powerful hot hatches. 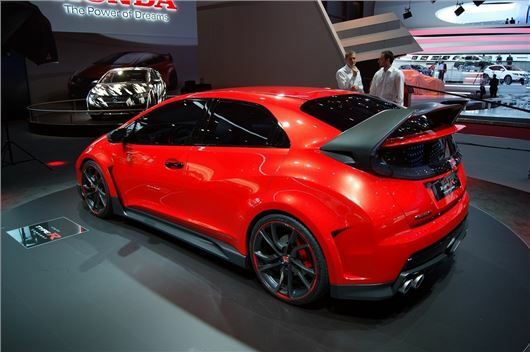 It will certainly be a different prospect than the last Civic Type R which had 200PS when competitors had more. As you'd expect the new Type R will have numerous changes made to its suspension set-up - and it has been honed by several professional drivers, including Honda WTCC's Gabriele Tarquini. Considerable development time will be put in at the Nurburgring Nordschliefe and Honda aims to make it the fastest production front-wheel drive car there. Although the latest Civic was launched in 2012, the Type R won't be going on sale until 2015.